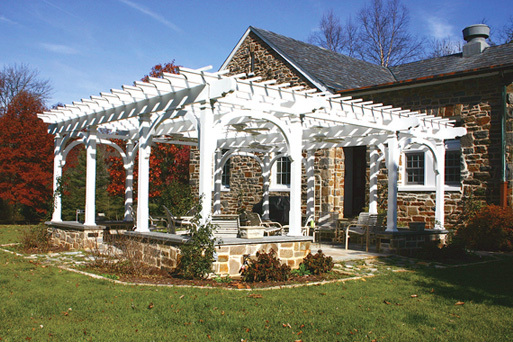 Designed to sit atop a low stonewall this substantial pergola establishes a clearly defined, yet open, outdoor room. 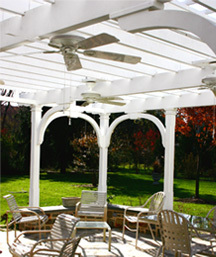 Special beams were made to span the 19 feet across the center of the pergola, while "T-rafters" placed 12" on center, help to create shade. 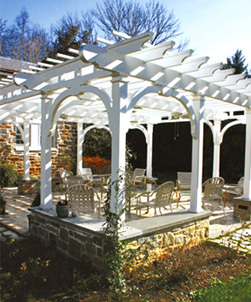 The keystone arches provide an attractive framing device and aid in stabilizing this very large structure. Inside the "room" two ceiling fans provide a steady breeze on hot summer evenings.